A consultation session between Vocations Directors & Coordinators, and renowned psychologist Dr Gregory Bottaro. He is an American psychologist who specialises in vocational discernment and spiritual & leadership development. He has an interesting history having spent four years with the Franciscan Friars of the Renewal under Fr Benedict Groeschel, before discerning a call to marriage. I have copied further information about him below. 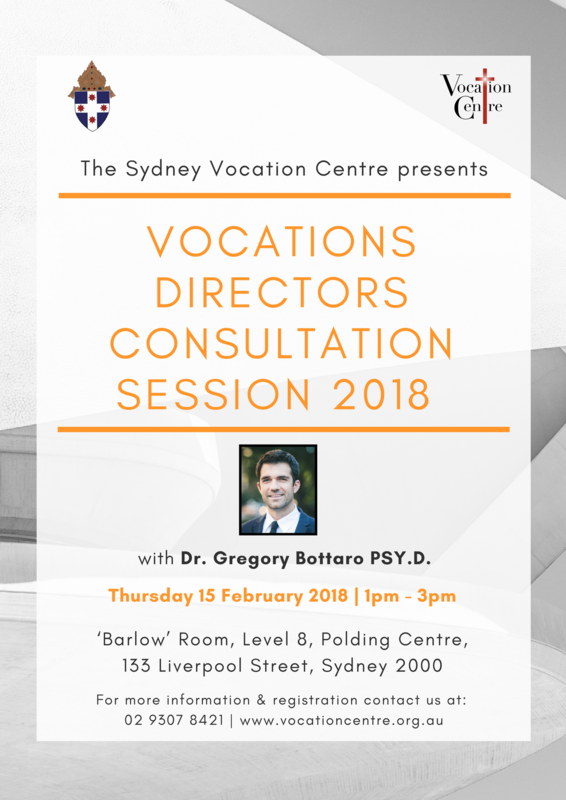 The aim of this session is to provide a consultation between vocations directors and Dr Bottaro on the role of psychology in vocations discernment, and the care of applicants to the seminary and seminarians. The session will be held at the Polding Centre, 133 Liverpool Street Sydney, on Thursday, February 15th 2018 from 1pm-3pm. The event will be hosted by The Sydney Vocation Centre, with the attendance of Bishop Anthony Randazzo as well. Lunch will be provided at 1pm. Dr. Bottaro is a clinical psychologist practicing in Connecticut serving the greater New York Metropolitan area and many others through online therapy. He received his Psy.D. (Doctorate in Clinical Psychology) from the Institute for the Psychological Sciences, a graduate school in Arlington, VA that integrates Catholic philosophy and theology with sound, empirically validated psychology. Before finishing his degree, he discerned a religious vocation with the Community of the Franciscan Friars of the Renewal (CFRs). He lived four years in the Bronx, serving the poor in the tradition of St. Francis. These years were emotionally, spiritually, and professionally formative as Dr. Bottaro tested his vocation and ultimately felt the prompting of God’s will to pursue family life. Six years after leaving NYC as a friar he returned as a psychologist. His aim is fundamentally the same – to serve. Instead of serving those suffering material poverty, he now seeks to serve those with psychological needs. Dr. Bottaro formed the CatholicPsych Institute in 2012 to connect Catholics around the world with therapists trained to integrate the faith with the practice. There are many different types of psychological needs. CatholicPsych therapists are trained to provide treatment for the worst types of psychological suffering, as well as provide a therapeutic atmosphere to gain insight into some of life’s basic adjustments and issues. Dr. Bottaro received his MS and Doctorate of Clinical Psychology from the Institute for the Psychological Sciences. He studied philosophy under Peter Kreeft at Boston College before transferring to Franciscan University of Steubenville for a BS in Mental Health where he also studied independently with Fr. Norris Clarke, SJ in Metaphysics. Dr. Bottaro completed his supervised training at the Institute for Psychological Sciences Community Clinic for 2 years, and then received doctoral internship training at the Psychiatric Institute of Washington in Washington, DC. He specialized in group therapy for Severe Mental Illness, Adolescent Assessment, and individual assessment and treatment as well as group treatment for severe trauma at the Center for PTSD at PIW. Dr. Bottaro worked in the New York area for 2 years in private practice before moving to Connecticut. He has been working closely with the Archdiocese of New York as well as other dioceses and religious communities on program development, various retreats for married couples, and consultation for Archdiocesan endeavors.